Wash wipe and dry mangoes. Cut into 1/2" pieces. Remove the pulp from the seed and wipe the pieces with a dry cotton cloth. 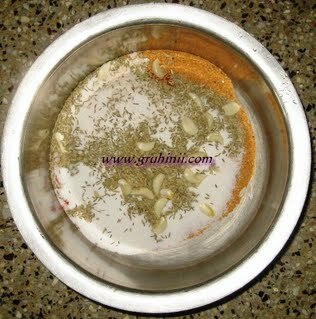 Take a dry vessel and mix red chilli powder,salt, rai ka dal, saunf, Hing powder,haldi, garlic flakes and methi powder well. 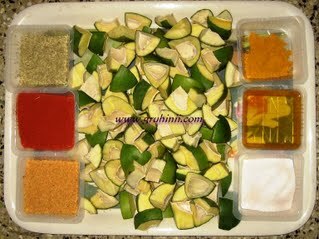 Now add the mango pieces and mix well. To it add half of the oil and put it into a dry glass jar. Pour the remaining oil over it. Put it in sunlight for 2 to 3 days. 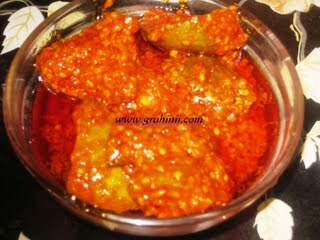 Mix the achar well, and taste. Add salt and oil if necessary. 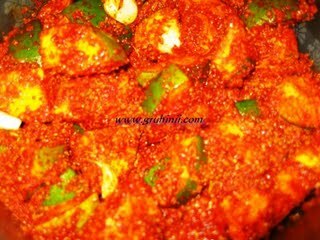 Aam ka achar is ready to eat.